Layer one was tested on every key. Some of the keys were not tested because they were meant to control things like lighting patterns, which have not been programmed yet. Notes were made to include print() statements whenever things like light pattern modes or piezo sound modes are changed. This will not affect the keyboard functions but should help considerably with debuggin and programming later. 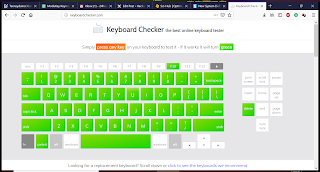 Since keystrokes were already programmed for the macros, AutoHotKey macros were set up which only displayed a window showing that the macro was acknowledged. Only four macros were present on layer 1 and all four worked. 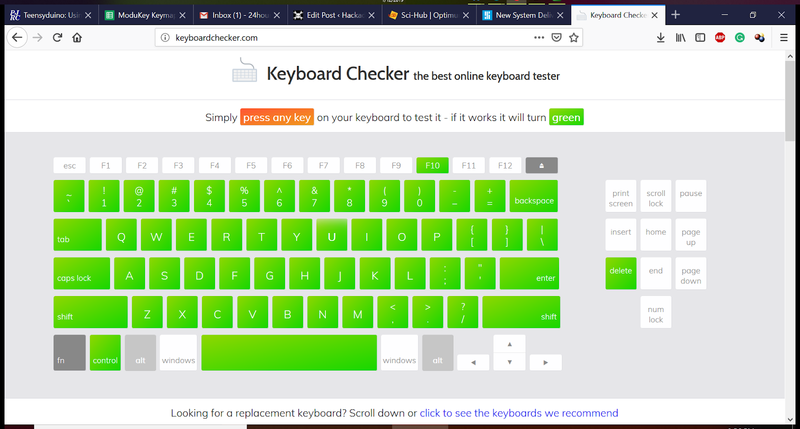 After painstakingly recording all the tests on a sheet of paper, the website keyboardchecker.com was found which turns each key green when it is pressed to make key checking simple. Nop security checks were done on this site so use at your own risk.